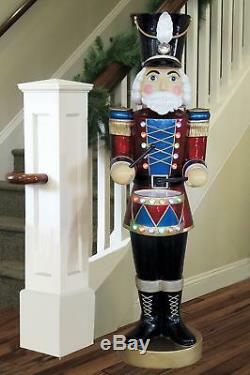 5' Musical Animated Nutcracker with LED Lights. 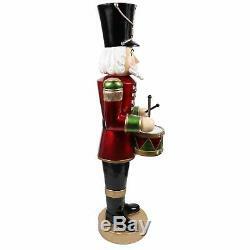 Add some festive charm to your home for the holidays with this beautiful 5' animated nutcracker. When switched on, the LED lights illuminate the nutcracker's jacket and drum. The hands move up and down on the drum to the sounds of a medley of Christmas carols. A 6'4' cord provides a generous length and plugs into a standard 120V outlet. LEDs light up on the nutcracker's jacket and drum. Hands and drum sticks move up and down on drum while music plays. Plays snippets of 8 Christmas songs in a continuous loop. Songs are Jingle Bells, We Wish You a Merry Christmas, Silent Night, Deck the Halls, Joy to the World, Noel, Hark the Herald Angels Sing and Oh Christmas Tree. 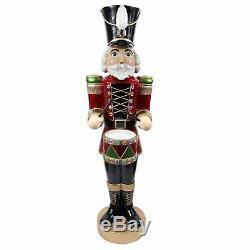 Includes nutcracker, LED lights, power cord. 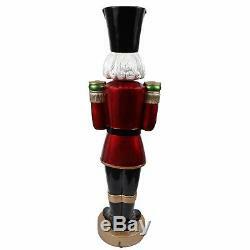 The item "5' Musical Animated Nutcracker with LED Lights" is in sale since Thursday, October 11, 2018. This item is in the category "Collectibles\Holiday & Seasonal\Christmas\ Current (1991-Now)\Figures\Other Curr. trading" and is located in 01501. This item can be shipped to United States.